The QMG Healthcare Foundation is a 501(c) (3) tax-exempt organization; all contributions are exempt from federal income taxes to the fullest extent allowed by law. So how can I contribute? Monthly Payroll Deduction (QMG Employees only), Cash, Publicly Traded Stocks or Securities, Real Estate, Closely Held Stock, etc. New to Amazon Smile? 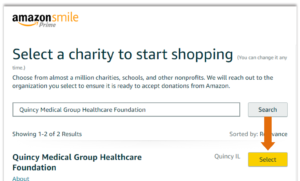 Here’s how to select the QMG Healthcare Foundation as a recipient. Log in to your Amazon account if you haven’t already done so. A search list will pop up on your screen. The foundation should be the first organization listed. Click Select. 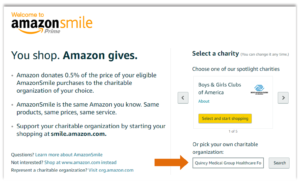 You must use smile.amazon.com when you shop online in order for your purchase to benefit the foundation.